We can’t believe believe that so much time has passed since we successfully funded our re-launch on Kickstarter, helping us bring The Fetch to you lovely folks everywhere. Today, we’re excited to share our progress so far – along with a first look at what’s coming next! We kicked off efforts by updating our existing style guide and re-designing The Fetch’s homepage. Designed to make submitting and finding events easy, we focused on simplifying the site to surface information Fetchers will need. You’ll see simple, clean pages in our signature, city colors – a fun, streamlined experience. If you want to secure your username aka vanity URL – make sure you head along to register now! In the new and improved version of The Fetch, we’ve separated local events and media. Dedicated to doing both things well, we’ve created a global reading list in addition to the regular, local event-based email (coming soon). The weekly global reading list will give you much of what you loved in former The Fetch emails: top stories, inspirational professional profiles, and all of the can’t-miss things that caught our team’s attention during the week. Haven’t subscribed to the new reading list yet? Join us here! Just as before, our curators remain an important part of The Fetch community. 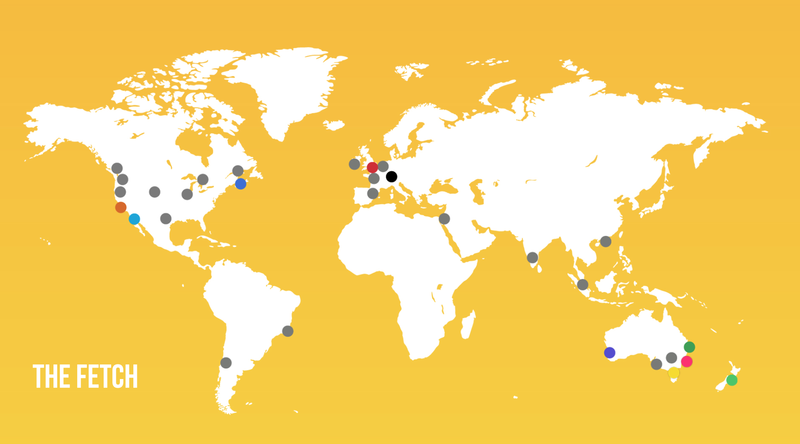 We’re grateful for amazing representation in the first of our five re-launch cities: Sydney, Melbourne, New York, San Francisco, and Berlin. We’re still taking applications, and would love to hear from you if you know what’s on and think your city needs The Fetch! Local events digest: We’re so close to bringing back the local events digest for our first five cities, which will feature the best happenings from the new platform neatly rolled into a weekly email and sent to Fetchers who live there. Our curators will begin testing this week, so expect to see local events in your inbox soon! 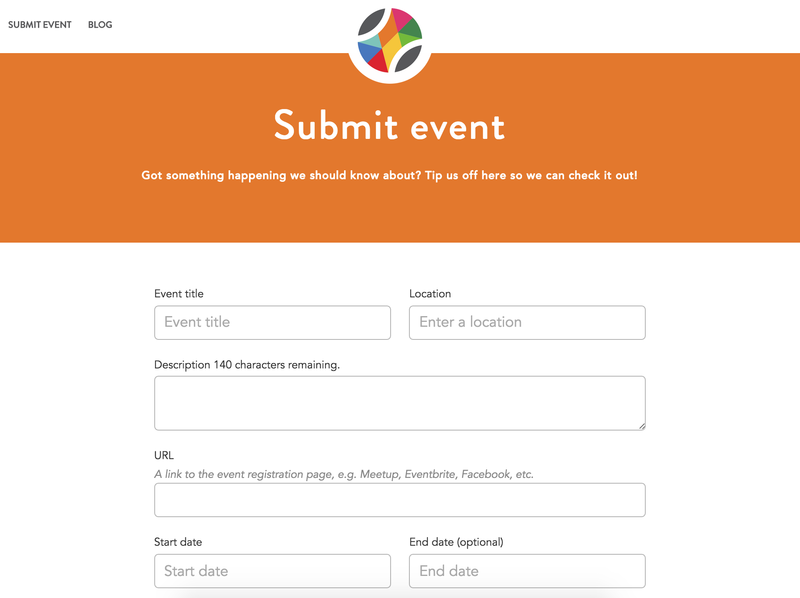 Individual event pages: Tell or learn more about an event with a description, image, and tags. Each page will have space for an image, along with social sharing functionality and calendar integration. Get a sneak peek here. Event search functionality: From community breakfasts to programming workshops, you will be able to find events by type, category, or skill level. Our goal is to help you crush your work-life with the best events and great reads with each email, so please continue to share your feedback as we move along. Thanks for your continued enthusiasm – we love hearing from you! This is a promoted post from our friends and Kickstarter backers at YOW! Conference. Over 2,000 tech professionals will learn from the best and are expected to attend YOW! 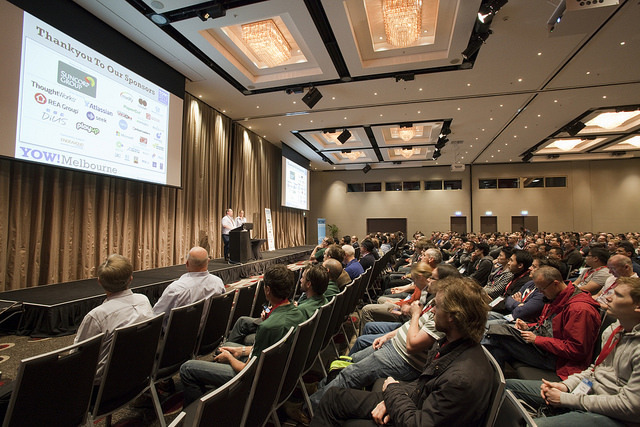 2014 Conference which operates across three cities, with 42+ Speakers, 39 Talks and 24 Workshops. There are over 42+ national and international software authors, thought leaders and world experts presenting this year about the latest practices, technologies and methods in software development and delivery. Many speakers have not presented in Australia before so this is a great opportunity to learn from them while they are in town! You can download the list of speakers here. Topics covered in 2014 include the latest in Agile & Lean, Microservices, Architecture & Design, Functional Programming, Big Data & Analytics, Web & UX, DevOps, Performance & Security, Mobile, and Languages. 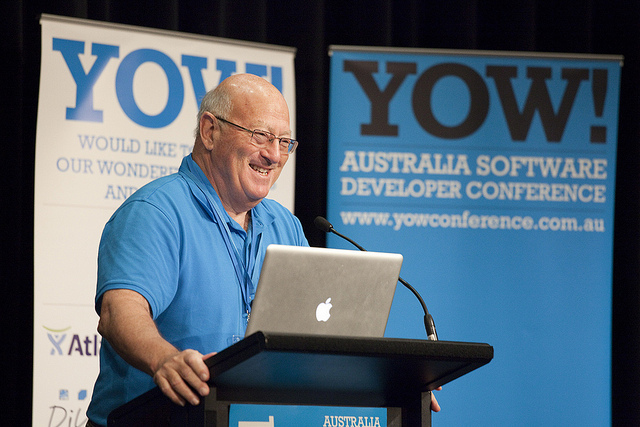 Check out the 10 Reasons why you should attend YOW! 2014 Conference. These workshops are a great way to learn specific skills, network and brainstorm with international field experts, local thought leaders and other talented developers about the latest practices, technologies and methods. Don’t miss out as places are limited. Learn more about the workshops in Melbourne on 2-3 December or Sydney on 9-10 December. The past three years have been an exciting whirlwind of a journey, as The Fetch grew from its humble beginnings as an email newsletter and side project into a vibrant and diverse community of professionals from around the globe. We’ve proudly watched it evolve, and even outgrow itself. This is a good challenge to have, and one that we’re now tackling with all of our passion – but we need our community’s continued support to make it a reality. In order to build a true curated city guide for professionals across the globe, we’ve launched a Kickstarter campaign. There, you’ll learn more about our mission and what you can expect from The Fetch if we get your backing. We believe that in this cluttered, crazy digital world, in-person interactions are more important than ever, and we want to be the catalyst to make those happen. 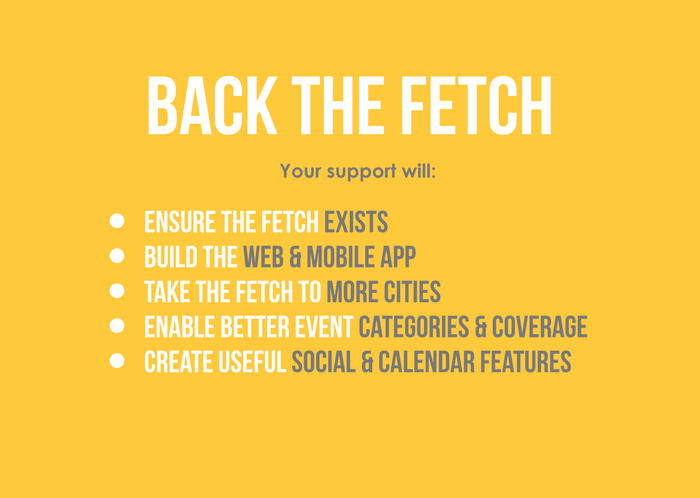 We hope that you decide to support the campaign, and help us mold the future of The Fetch. We can’t thank all of our community members enough for all of your support and dedication. To help make this campaign a success, please share it with your friends. “The Fetch has allowed me to invest in my own growth. I have been able to forge new friendships, develop skills and pursue unexpected interests because of what The Fetch has put in my path. As a result of the things I am aware of in my community, I have become better equipped at guiding other people towards the resources they need to fuel their own aspirations and endeavours.” ~ Jackie Antig, City Ambassador. Thank you again and we look forward to building something great with you! We recently passed three years since the first humble email digest was sent in Melbourne. The Fetch was just a teeny tiny side-project then with the goal of making it easier to discover all the events happening that the rest of the event and city guides didn’t cover. Since then, we’ve been on a journey, delivering curated goodness to the community week after week – in cities all around the world. Countless hours have been put in by our community of tireless curators, including dedicating our Sundays to prepare so that we could kick off your work week with your local issue of The Fetch. We’re now starting to think about our future. It’s exciting… and scary! 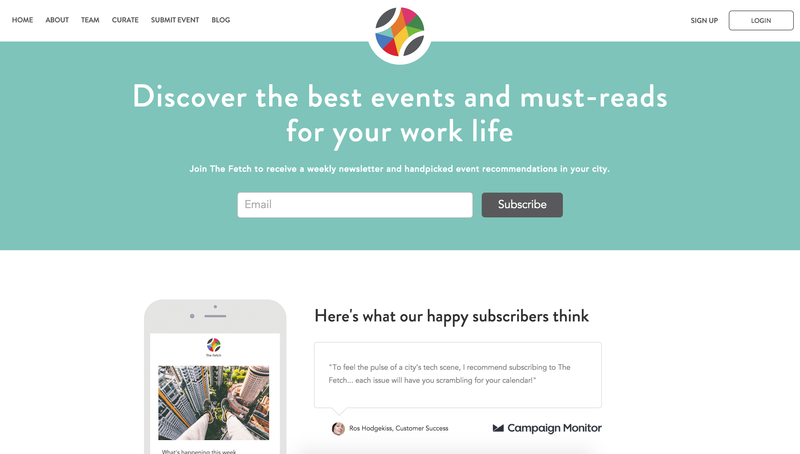 Over the coming weeks, you’ll start to notice many updates to The Fetch – including a new logo, a new email design, the transition to one global newsletter of the ‘Link-love, must-reads’ section, and the launch of a new responsive landing page. From here, you’ll be able to sign-up to reserve a username for the next generation of The Fetch – an app that does a way better job of delivering you events (customized for you, less noise, and more relevancy with social and calendar integration). Most importantly, this platform will allow us to have a better foundation to sustain our activities from – we will be able to spend less time creating and editing The Fetch emails manually – and more time on quality and breadth of content. We’ve decided that there’s no point in building this app if we don’t have the support of the community we love to serve. After all, if you don’t find it useful or actually want/need it, then perhaps it shouldn’t exist! A good way to understand this support is via crowdsourcing funds so we’ll be launching a Kickstarter campaign over the coming weeks. We hope you back us! The map above shows a few of the 70-plus requests we’ve had to take The Fetch to more cities. The grey dots are where we’d expand to with the new platform. If you’d like to pass on any feedback about where we’re going and where we’ve come from – or to chat about sponsoring or adding to our list of Kickstarter prizes, please email me kate@thefetch.com.